I celebrated a milestone birthday last week. My birthday cake was a delicious Boston Cream Pie. 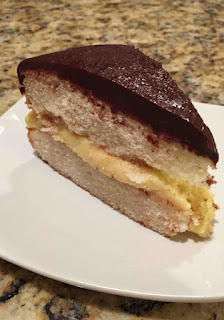 I found this recipe at Life, Love, and Sugar, and after a tiny bit of tweaking, I made my cake. 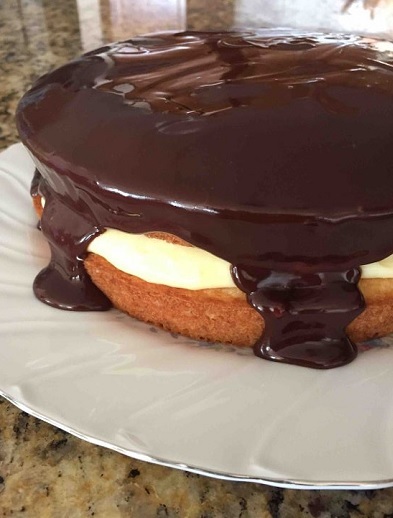 There are three components to this dessert: the cake, the cream filling, and the chocolate frosting. The recipe looks a little complicated, but it’s not at all difficult and the result is scrumptious! I hope you’ll give this recipe a try. 1. Preheat oven 350° F. Spray two 9-inch round cake pans with baking spray, line bottoms with parchment paper. 2. Stir together the flour, baking powder, and salt in a bowl and set aside. 3. In the bowl of electric mixer, cream together the butter, oil, and sugar until light and fluffy, about 4-5 minutes. 4. Add the vanilla and mix to combine. Add eggs one at a time and beat on medium speed until well incorporated. Scrape down the bowl and beater to ensure all ingredients are combined. 5. With the mixer on low speed, add half of the flour mixture, then add the milk. Add the remaining flour mixture and beat on medium speed only until flour is incorporated, stopping to scrape down the sides as needed. Over beating at this stage results in a cake that is dense and tough rather than light and fluffy. 7. Remove cakes from the oven. Allow to cool in pans for 5 to 8 minutes. Then turn out cakes onto racks to cool completely. 1. In a medium size saucepan, mix together the sugar and cornstarch. Add the milk and stir to combine. Cook over medium heat, stirring constantly, until mixture boils and thickens. Turn down the heat and simmer for a couple of minutes. Remove from heat. 2. Place egg yolks in a medium size bowl and whisk until smooth. Temper the yolks by adding a small ladleful of hot, thickened milk mixture to the yolks and whisk briskly. Add another ladleful of the milk mixture to the yolks and whisk again. Then add the tempered yolk mixture to the pot of cream filling and whisk together. Place pot back on the heat and simmer, whisking constantly, for 2 minutes. Remove from heat. 3. Add butter and vanilla, stirring to combine. Pour cream filling into a bowl, cover with cling film, placing the plastic directly on the surface to prevent a skin from forming. Place in the refrigerator to cool. 1. Place chocolate chips and corn syrup in a small bowl. 2. Heat the cream in a small saucepan until just at the simmering point. 3. Pour hot cream over the chips and allow to sit for 3 minutes, then stir the chocolate until smooth and silky. Assemble the Boston Cream Pie by placing one layer of the cooled cake on a cake plate. Spread the cream filling on the cake layer. Top the cream filling with the second cake layer. Pour the chocolate sauce over the top of the cake, allowing the sauce to drizzle over the sides. Refrigerate until ready to serve. Cake is best eaten the day it is baked but can be kept, covered, in the refrigerator for up to 3 days. Labels: Birthday Cake Recipe, Boston Cream Pie Recipe, Delicious Recipes, What's for dessert?